The cities are roughly comparable. Seattle just bid adieu to a progressive bike-friendly mayor. So did Minneapolis. Seattle has a highly-educated healthy population. So does Minneapolis. Seattle's home to the corporate headquarters of Fortune 500 companies like Starbucks, Amazon, and Nordstrom. Minneapolis has Target, US Bank, Xcel Energy, and Ameriprise. Seattle has Macklemore and Ryan Lewis, Minneapolis has Doomtree. What can Minneapolis learn from Seattle? There are many ways businesses can make profitable investments in bike stuff. They can make the pledge with Bikeways for Everyone, which costs zero dollars. They can reward bike commuters, like Quality Bicycle Products and the Bill and Melinda Gates Foundation do. They can use the city's cost-sharing program to build more bike parking for employees and customers, or they can follow Amazon's lead and actually build a protected bike lane by their corporate headquarters. Chicago mayor Rahm Emanuel is trying to attract talented workers with a world-class network of bikeways, and Minneapolis businesses should join the movement for safe, convenient bikeways to gain a competitive edge. If you're an activist, you might be tempted to focus exclusively on changing the minds of "decision-makers" — elected and appointed officials, planners, and engineers. They're the important ones, right? Not always; sometimes change happens from the bottom-up. Seattle's popular and visionary bike plan was influenced and supported by stakeholders from all corners of the city. The Seattle Department of Transportation collectively spent thousands of hours meeting with neighborhood organizations, businesses, residents, and other stakeholders all over the city, listening to their hopes and concerns for their neighborhoods. All this work paid off in two ways. First, the stakeholders' input improved the plans by tailoring them to the unique needs of each neighborhood. Second, the stakeholders became emotionally invested in the plan, and worked to see it come to fruition. There's hardly a more effective way to persuade a public official than by packing a meeting with diverse and enthusiastic supporters of safe streets. Bikeways for Everyone is working hard to involve places of worship, PTA boards, health advocates, local businesses, large corporations, racial equity groups, and car-sharing companies to work together to improve Minneapolis's streets. If you're interested in getting more information for your organization, just send an e-mail to info@bikewaysforeveryone.org. A well-organized public outreach campaign can be ruined by too much engineering jargon. Some of the Seattleites who spoke against the bike plan were confused about the terminology. Seattle Bike Blog reports: "One neighbor said she would prefer a 'slow bike trail' over a 'cycle track.' These terms, as far as I can tell, refer to the same thing." Recent research shows that practically no one knows what "cycle track" means, so let's get more descriptive: "protected bike lane" clearly conveys the characteristics and benefits of the infrastructure. Another speaker in Seattle was concerned that the protected bike lane would "occupy half the street," in contradiction to the dimensions in the plan. People receive and retain information in different ways, so it's important to have cross-sections, bird's-eye views, detailed descriptions, and artistic renderings so all kinds of folks can wrap their heads around the proposals. It's also about attracting young workers to Minneapolis. It's about easing the burden of transportation costs on low-income families. It's about creating opportunity for communities of color by connecting neighborhoods. It's about reducing the congestion and wear-and-tear on our streets. It's about rebuilding the population of Minneapolis in a financially sustainable way. It's about addressing our health crisis. It's about improving our quality of life. Building world-class bike infrastructure is just as much about possibilites as it is about problems. 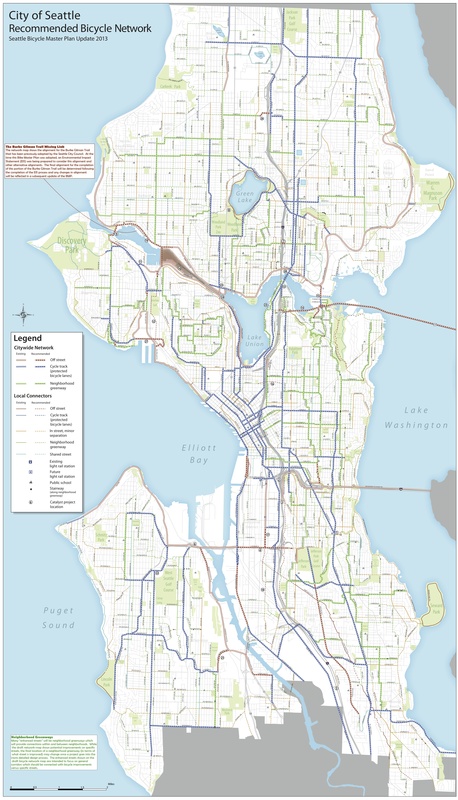 Seattle Neighborhood Greenways won supporters in all the corners of the city by promoting improvements that make streets safer for all users. That's something Minneapolis can get excited about, too.